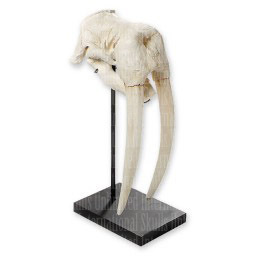 Walrus Skull - The walrus is native to the northern Atlantic, northern Pacific and Arctic oceans. Walrus have a thick layer of fat that helps to insulate them from the frigid waters they inhabit. This large pinneped is known for its characteristic canine tusks, which are found in both males and females. Walrus feed on a variety of mollusks and crustaceans. Like other seals, the walrus is designed for aquatic locomotion, but is capable of hauling its massive frame ashore to bask, mate, and give birth.